Well there has been a lot of us GPS fanatics with iPAQ 3870 and 3970 or other Bluetooth enabled computers eagerly awaiting the advent of the next level of GPS receivers. That day has arrived with the launch of the Emtac BT GPS receiver. The World's first wireless GPS receiver using the new BlueTooth Technology. The review unit was provided to us by Itochu Europe PLC, the UK importer and distributor of Emtac products. 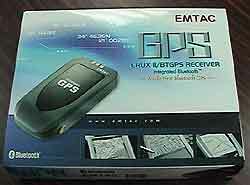 Itochu corporation is the exclusive distributor of EMTAC BTGPS on the worldwide market. 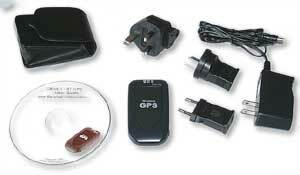 They provide OEM units to Socket in Europe and America and sell the BT GPS receiver with the Emtac brand name. Itochu UK is the distributor of Emtac in the UK, Itochu France, is the distributor of EMTAC in western Europe (except UK and Italy), Texmac, another subsidiary of Itochu Corporation group is the exclusive in Italy and Eastern Europe. At the time of writing Expansys were advertising the receiver for £272.98 (including tax) badged under the Socket label, although they are suggesting a 10 working day delivery timescale. Premier Electronics are advertising at £279.00 (excluding VAT) for the Emtac badged receiver. The equipment used during this review was the Emtac BT GPS, an iPAQ 3870, and a Toshiba Tecra 8000 portable PC with a TDK Bluetooth USB dongle. Warning. The author and Pocket GPS present this article as an evaluation of the Emtac BT GPS receiver based on their own experience. It is your responsibility to ensure that it is used in a safe manner and is suitable for your requirements. The Author and Pocket GPS accept no responsibility for accident, loss, damage or injury however caused. A holster for the GPS receiver. I had seen articles about the Emtac BT GPS suggesting that it was quite small and compared to 3 PCMCIA cards, but when you actual handle it you realise just how small and light it actually is. The top panel has the Wireless GPS branding but you will find that the branding will change for the Socket or other OEM versions of the receiver. Underneath the branding badge is the GPS's internal aerial. On the bottom end of the unit are 3 status LEDs an on/off switch and the power socket. On the side of the receiver is a connector for an external MCX type aerial. 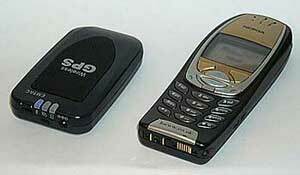 The Emtac BT GPS height is a shade smaller than the Nokia 6310i, and is as wide as the widest part of the phone. It is about two thirds the length of the 6310. One important feature is that the underside of the receiver has a strip of rubber at each end which means that it does not wander over the dashboard when driving. This was my first use of a Bluetooth serial device. I had experience of using Bluetooth with both my Portable Computer and also my Nokia 6310i so connecting was not a problem. The CD actually has an excellent guide for connecting the Emtac BT GPS. It is full of screen pictures with simple instructions, following these instructions resulted in a first time connection. I took the option of creating a bond between my iPAQ and the Emtac. When bonding you must use a passkey of '0183'. Connecting it to the portable was much more challenging. There were no instructions for connecting devices other than a Pocket PC. I managed to make a connection between the Emtac very easily, but I was unable to open the serial port. Checking the properties of the connection I found there was no COM port assigned. OK I thought that I was doing something silly so scanned the TDK website for FAQs or other help. Not finding anything helpful I fired off a detailed request for assistance from TDK support. All I ever received back from them was an automated response acknowledging my request. I also sent two email chasers in an attempt to get the setup working for this review. Still no response received. I decided not to give up on this and played around with some of the settings with no joy. Then, feeling a bit despondent, when I was on the phone describing the problem to a friend and attempting to reproduce the error I suddenly found that the error did not occur and the serial port had been opened successfully. Strange because I had done nothing differently. Ever since then I have been able to connect every time I have tried. Connecting on both the iPAQ and the Toshiba now is a simple matter of ensuring that both Bluetooth devices are switched on, then simply starting the GPS application and opening the GPS serial port. This then opens the connection between the two devices and reports GPS positioning information. The Emtac only supports connection to a single device so the utopia of connecting multiple devices to the receiver cannot be realised at the moment. I was, therefore, unable to connect both the iPAQ and the Portable PC to the Emtac at the same time. However having said that I did manage to have 3 GPS applications open at the same time. How did I manage to achieve this? As a result of exchanging messages with some of the guys on the OziExplorer newsgroup I applied a little lateral thinking and used the NMEA out feature of Fugawi (OziExplorer has an Autopilot feature but I did not try this). Rather than send the output to a normal serial port I sent it to a Bluetooth serial port. I was then able to connect the iPAQ to the Portable BT serial port, and quite happily get GPS positioning data. The only thing that seemed to be missing was the data providing satellite strength information. I am still investigating this at the moment. Even more interestingly I accidentally opened a second GPS application on the iPAQ and somehow that also started to receive GPS data I haven't actually used it actively yet so I am not sure about the stability of this set-up. The only thing I can assume is that somehow Bluetooth is multiplexing the serial ports, I have not worked out which end is doing the multiplexing, other than knowing that it is not the Emtac. The Emtac is able to connect to your PDA or PC straight out of the box. There is no need to configure it for normal use. I was amazed at the speed of Fixing. The first fix straight from the factory was so quick I didn't manage to time it (less than 2 minutes). Subsequent cold fixes first thing in the morning take less than 60 seconds, typically being in the 45-50 second range. The average was spoilt by one fix which took 4 minutes 43 seconds, but this was offset by a fix of less than 20 seconds. In general, when I get into my car I switch the Emtac on put it on the dash start the car and hook up the iPAQ by which time I have a fix and can start driving. What about number of satellites used in fixing and signal strength? Well yet again I was surprised! With my original sleeve I would normally get a fix on between 3 and 6 satellites with the occasional 7 sat fix. With the new Emtac GPS sleeve (as supplied with the latest release of co—pilot) I would normally have a fix on 5 to 8 satellites. With the Emtac I normally get a fix on 7 to 10 satellites, with 9 and 10 being very regular. The first time this happened I really could not believe it. I thought that maybe something was wrong, or maybe it was a specially clear day or something. I was surprised when the same thing happened the next day, and regularly thereafter. As you can see from the above screen pictures I have achieved 10 satellite fixes on different days using different applications. I have also enabled WAAS/EGNOS and attempted to get a fix. This is not so reliable as a normal fix as you need line of sight to a single satellite, which although being Geostationary, may not always be available. In Europe the EGNOS system is still in test mode and may not be reliable. The screen image to the left shows a differential fix in OziExplorer, taken with the receiver on my office windowsill. I then decided to put the unit to a real test to see it's capabilities. First I put the receiver on the windowsill in my office, I often use this when testing, though with other receivers I would only get a maximum 3 satellite fix. The Emtac came in strongly with a 5-6 satellite fix, and I even get a 5 satellite differential fix. I decided to take this one stage further and moved the receiver deeper into the office. I ended up with the receiver on top of a filing cabinet 1.75metres high and 3.5metres from the window. Amazingly I still had a 4 satellite fix. I have had similar experiences when driving, I have found that I can get a very good signal with the receiver in my pocket, or even on the floor between the front seats. When I go out walking I put the Emtac in the front pouch of a small camera bag with the iPAQ just behind it. This is the only time when I have seen a degradation of signal reception, dropping from 8-9 sats to 5-7, still a very acceptable reception. I have not been able to test the Emtac in situations where there is heavy foliage as it is now winter in the UK, when I first received the unit there were a few leaves on the trees, but the last few went within days of me testing, and it would be unfair to produce a comparison under these conditions. The Emtac receiver on top of my filing cabinet. The one thing I have not mentioned yet is the re-acquisition times. The other day I was able to test this in a real environment: Driving through the Dartford Tunnel on the M25. The satellite signal was lost as expected after we were about 50 meters inside the tunnel, as we cam out the other side the receiver re-fixed within seconds, far too quickly to time. This, again, is something I have never experienced normally other GPS receivers I have used have taken between two and ten minutes to re-fix. The receiver works straight out of the box so configuration is not required, but Emtac provide a utility to allow you to monitor and set some features of the receiver. This is provided on the CD and is called CRUX-View. CRUX-View is run on the iPAQ and provides a series of 6 screens to examine the GPS receiver: GPS Status; Position; Message; WAAS; Low power; and about. The main reason to use the CRUX-View utility is to set the receiver to use the WAAS or EGNOS differential fixing to get a more accurate position reported. The functionality of this is arguable for driving but could become essential for other uses such as Emergency services, municipal workers, engineers, mountaineers etc. The Emtac is powered by an internal Li-on battery. This is charged by connecting the the transformer provided in the package. The manufacturers claim 6 hours continuous usage. In my trials I have found the receiver to last for up to 8 hours and never less than 6 as specified. A refreshing change for these figures to be quoted conservatively. The Emtac is provided with a power socket which has the same plug as the iPAQ and many other 5v devices. The manual states that you should only use the supplied charger otherwise damage may occur to your receiver. This could be a big restriction if you need to use the GPS over extended periods and cannot get to a power outlet. With this in mind I contacted Itochu to determine the real position and was told that the iPAQ car power supply was OK to use with the Emtac, so no worries about running your battery flat. What doesn't it do ? Those of you out there that are used to traditional handheld GPS receivers will not find any track recording, waypoints, routing, or navigation built in to this device. It is purely a GPS receiver. The day the Emtac arrived I had to go out on business and only got back at 8pm so didn't have much time to play with it. What I can say immediately is that it's ability to get a fix is incredible. I am not quite sure how long it took to get the first fix from factory delivery, I powered the Emtac on, set my stop watch and went to make a cup of coffee. When I returned after 2 minutes the receiver had already got a fix. Later on I was trying to get connected to my iPAQ with the Emtac next to me in the centre of my lounge which is at least 3 yards if not 4 from the nearest window and I found that I had a 5 satellite fix. I really found that incredible, the only other receiver I had seen that could come anywhere near this was the Garmin GPSMAP76 which could only manage a fix on 2 satellites. Later on that night I enabled the WAAS and went to bed leaving the receiver active on the windowsill of my office. The next morning I had forgotten about the WAAS and set off in the car to the station and to take my dog out. I was amazed at the number of satellites being fixed by the receiver: 8-10 when I normally get 3-5. When I stopped and switched from Tom Tom to OziExplorer I found that I had a 3D (differential) fix on 10 satellites, (yes that really is 10 satellites). Normally with my other GPS sleeve receiver I would be looking at 3-5 at 3G (normal GPS fix). When entering the woods the signal dropped to a 3G fix so obviously WAAS had kicked in and dropped out when I entered the woods. As regards the accuracy I set waypoints at two well defined but small 3 foot by 3 foot locations one day, and revisited them over the next few days, in different weather conditions. In both cases I only had a 3G location fix no WAAS, so this should determine the accuracy of the receiver in a variety of conditions. The following days I managed to accurately navigate to the exact same locations the receiver reported a 2 foot discrepancy on one occasion and 5-6 feet at other times. None of these were achieved using WAAS. I did notice that once on the waypoint my position would shift, and was more accurate when moving towards the waypoint. Over 5 occasions in varying weather conditions the variance when stationary was at most 10 feet. OK so now the downside! Well there is little wrong with the Emtac BT GPS receiver other than it's reliance on battery power. This is not really a downside as the battery can last for up to 8 hours. Only a really long car journey or an extended hike using the receiver all the time would deplete the batteries. Despite warnings in the manual I have been told that the receiver can be powered from the iPAQ cigar lighter power supply so it can be charged up during long journeys. The iPAQ Bluetooth manager seems to be a bit buggy. I tried doing the sensible things like turning the iPAQ off and then back on and found that the system had crashed and was in snail mode so a soft reset was required. A couple of times the BT Manager crashed when trying to connect to the Emtac. I since re-installed the iPAQ BT manager and have had fewer issues. Switching on the WAAS functionality is easy just a matter of configuring it with the supplied utility. You need a clear view of the sky for WAAS to work, but I did appear to be getting 3D differential fixes today implying that WASS was working. Moving into the trees lost the differential fix and dropped back to the 3D location fix. So you cannot rely on getting WAAS fixes all the time. Almost GPS utopia but not quite. I am not really sure if utopia is ever achievable, but you really cannot get much closer. This has to be the most innovative and impressive piece of new technology in the GPS arena. Where Emtac leads surely others will follow. Bluetooth is established as a standard for wireless communications between phones, PDAs, Portable PCs, printers, and now GPS receivers. 1. The battery life, which although was excellent and more than sufficient for my needs, extensive driving trips or long hikes could drain the power. However there are more issues with power management on the PDA than there is with the Emtac. I have been informed that there is a new product in development which has a removable battery that could overcome these issues, combining this with the new HP iPAQ 5450 which has better power management may be a much better solution. 2. The price. �272.98 or �400 is a bit expensive for a GPS receiver with no software. That said it is cutting edge technology and will probably come down in price in time. The question is can you wait? Wish list item: I realise that this is 'just' a GPS receiver but to make it perfect having the ability to record tracks would be extremely useful when out hiking, biking or climbing. That way the receiver would remember where you went and you would only need to switch your PDA on when you needed to consult it for your location thus saving valuable battery power. You could later download and manage your tracks in the PDA or PC application. Would I buy one? NO!!!! Why not? Because I wouldn't send the review receiver back. In the words of Victor Kayam "I was so impressed I bought the company" (Remington shavers). Well I couldn't afford the company but I made sure I purchased the receiver. 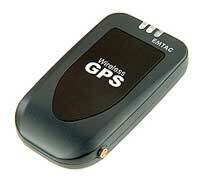 I certainly would not like to be without it, it is far better than any other GPS receiver I have used. Christmas came early for me this year!